Ken Palley and Dr. Mark Morey from Surfrider Foundation, Santa Barbara Chapter accept a donation from Zach LeLevier-Joseph (Vice President / Property Manager) of Westar Associates. Goleta, CA – Westar Associates, the real estate developer for the Hollister Village mixed-use project in Goleta, has recently donated $5,000 to the Surfrider Foundation Santa Barbara Chapter. The Surfrider Foundation is a national non-profit environmental organization dedicated to actively preserving and protecting the world’s oceans, beaches, and sea life. 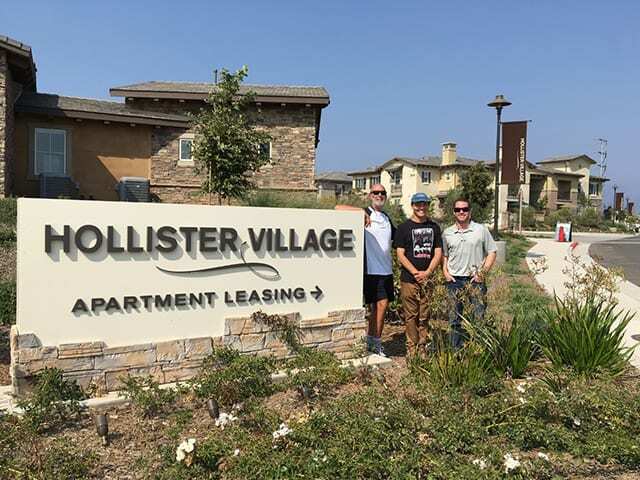 Before accepting the donation, Dr. Mark Morey and Ken Palley from the Surfrider Foundation Santa Barbara Chapter took a tour of Hollister Village to receive a better understanding of the development’s green approach. They were shown various features including drought tolerant landscaping, EV charging stations, solar panels, bio-retention areas, bio-swales, and storm water detention system and filter chambers. Dr. Mark Morey and Ken Palley expressed the most interest in the underground detention system filters and filter chambers, which collect sediment and trash to minimize pollution from runoff, as well as all of the curb cuts throughout the property that allows water to drain to the bio-retention areas and bio-swales. As a result, Ocean Friendly Gardens, a program that is part of the Surfrider’s Clean Water Initiative, now recognizes the Hollister Village project as a development that applies CPR – Conservation, Permeability, and Retention to its landscapes and hardscapes. Hollister Village is the only shopping center and apartment community to receive this acknowledgement in the City of Goleta.